All 6th, 7th & 8th Graders Welcome! Thursday, January 31, 2019 | 7-9 p.m. 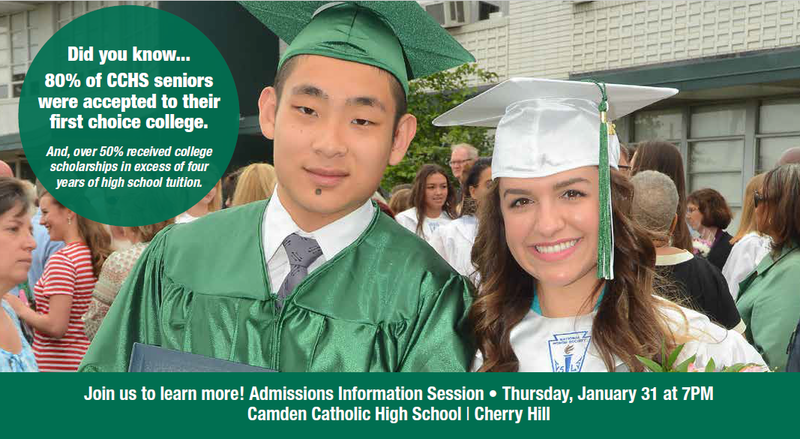 Whether you are an 8th grader still making your decision about high school, or a 6th or 7th grader planning for your future, please join us to learn more about the admissions process, curriculum, arts and athletics at Camden Catholic High School. This is a general information session in which you will have the opportunity to meet our students, faculty and administration, tour our campus, and have your questions answered. Register online at www.camdencatholic.org/admissionsevents, call the Admissions Office at 856-663-2247 ext. 136 or email janet.indelicato@camdencatholic.org.